(Francisco Kjolseth | The Salt Lake Tribune) BYU announces Mark Pope as its new head basketball coach during a press event at the BYU broadcasting building on Wed. April 10, 2019. (Francisco Kjolseth | The Salt Lake Tribune) Mark Pope takes questions from the media after being announced as BYU's new head basketball coach during a press event at the BYU broadcasting building on Wed. April 10, 2019. 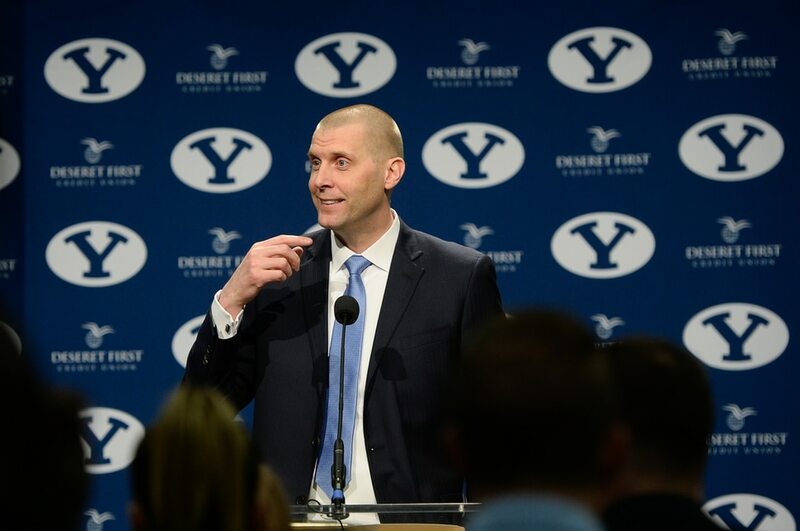 (Francisco Kjolseth | The Salt Lake Tribune) BYU announces Mark Pope as its new head basketball coach during a press event at the BYU broadcasting building on Wed. April 10, 2019. (Francisco Kjolseth | The Salt Lake Tribune) BYU announces Mark Pope as its new head basketball coach during a press event at the BYU broadcasting building on Wed. April 10, 2019. (Francisco Kjolseth | The Salt Lake Tribune) Mark Pope takes questions from the media after being announced as BYU's new head basketball coach during a press event at the BYU broadcasting building on Wed. April 10, 2019. (Francisco Kjolseth | The Salt Lake Tribune) Mark Pope takes questions from the media after being announced as BYU's new head basketball coach during a press event at the BYU broadcasting building on Wed. April 10, 2019. (Francisco Kjolseth | The Salt Lake Tribune) Mark Pope takes questions from the media after being announced as BYU's new head basketball coach during a press event at the BYU broadcasting building on Wed. April 10, 2019. (Francisco Kjolseth | The Salt Lake Tribune) Lee Anne Pope looks over at her daughters as her husband Mark is announced as BYU's new head basketball coach during a press event at the BYU broadcasting building on Wed. April 10, 2019. (Francisco Kjolseth | The Salt Lake Tribune) Mark Pope gets a kiss from his wife Lee Anne as BYU announces him as its new head basketball coach during a press event at the BYU broadcasting building on Wed. April 10, 2019. 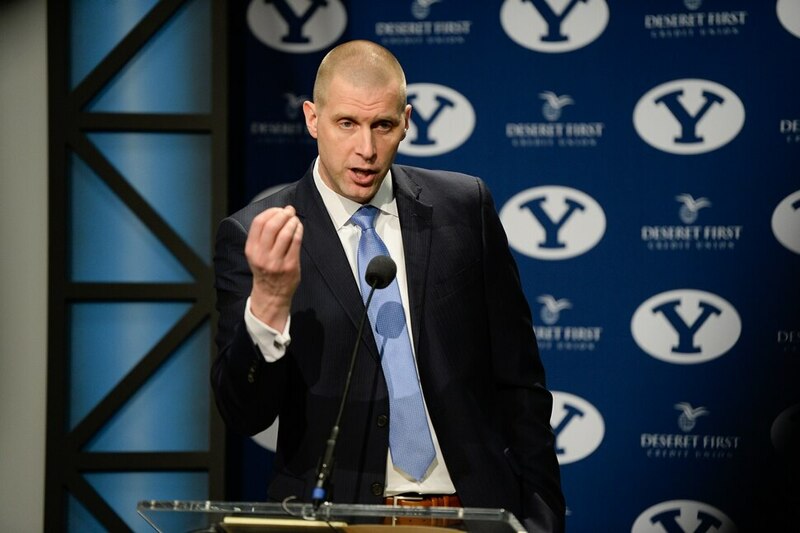 (Francisco Kjolseth | The Salt Lake Tribune) BYU announces Mark Pope as its new head basketball coach during a press event at the BYU broadcasting building on Wed. April 10, 2019. (Francisco Kjolseth | The Salt Lake Tribune) BYU announces Mark Pope as its new head basketball coach during a press event at the BYU broadcasting building on Wed. April 10, 2019. (Francisco Kjolseth | The Salt Lake Tribune) BYU announces Mark Pope as its new head basketball coach during a press event at the BYU broadcasting building on Wed. April 10, 2019. (Francisco Kjolseth | The Salt Lake Tribune) Mark Pope takes questions from the media after being announced as BYU's new head basketball coach during a press event at the BYU broadcasting building on Wed. April 10, 2019. (Francisco Kjolseth | The Salt Lake Tribune) Mark Pope takes questions from the media after being announced as BYU's new head basketball coach during a press event at the BYU broadcasting building on Wed. April 10, 2019. (Francisco Kjolseth | The Salt Lake Tribune) Mark Pope, alongside his wife Lee Anne speaks with BYU president Kevin Worthen after being introduced as its new head basketball coach during a press event at the BYU broadcasting building on Wed. April 10, 2019. (Francisco Kjolseth | The Salt Lake Tribune) Mark Pope, alongside his wife Lee Anne speaks with BYU president Kevin Worthen after being introduced as its new head basketball coach during a press event at the BYU broadcasting building on Wed. April 10, 2019. (Francisco Kjolseth | The Salt Lake Tribune) Mark Pope, center, alongside his wife Lee Anne speaks with BYU president Kevin Worthen after being introduced as its new head basketball coach during a press event at the BYU broadcasting building on Wed. April 10, 2019. (Francisco Kjolseth | The Salt Lake Tribune) BYU announces Mark Pope as its new head basketball coach during a press event at the BYU broadcasting building on Wed. April 10, 2019. (Francisco Kjolseth | The Salt Lake Tribune) Mark Pope looks over at his family as BYU announces him as its new head basketball coach during a press event at the BYU broadcasting building on Wed. April 10, 2019. (Francisco Kjolseth | The Salt Lake Tribune) BYU announces Mark Pope as its new head basketball coach during a press event at the BYU broadcasting building on Wed. April 10, 2019. (Francisco Kjolseth | The Salt Lake Tribune) Mark Pope takes questions from the media after being announced as BYU's new head basketball coach during a press event at the BYU broadcasting building on Wed. April 10, 2019. (Francisco Kjolseth | The Salt Lake Tribune) Mark Pope is introduced as BYU's new head basketball coach during a press event at the BYU broadcasting building on Wed. April 10, 2019. (Francisco Kjolseth | The Salt Lake Tribune) Mark Pope is embraced by Athletic Director Tom Holmoe as he is brought into the BYU family after being introduced as its new head basketball coach during a press event at the BYU broadcasting building on Wed. April 10, 2019. (Francisco Kjolseth | The Salt Lake Tribune) Mark Pope takes questions from the media after being announced as BYU's new head basketball coach during a press event at the BYU broadcasting building on Wed. April 10, 2019. (Francisco Kjolseth | The Salt Lake Tribune) Mark Pope takes questions from the media after being announced as BYU's new head basketball coach during a press event at the BYU broadcasting building on Wed. April 10, 2019. 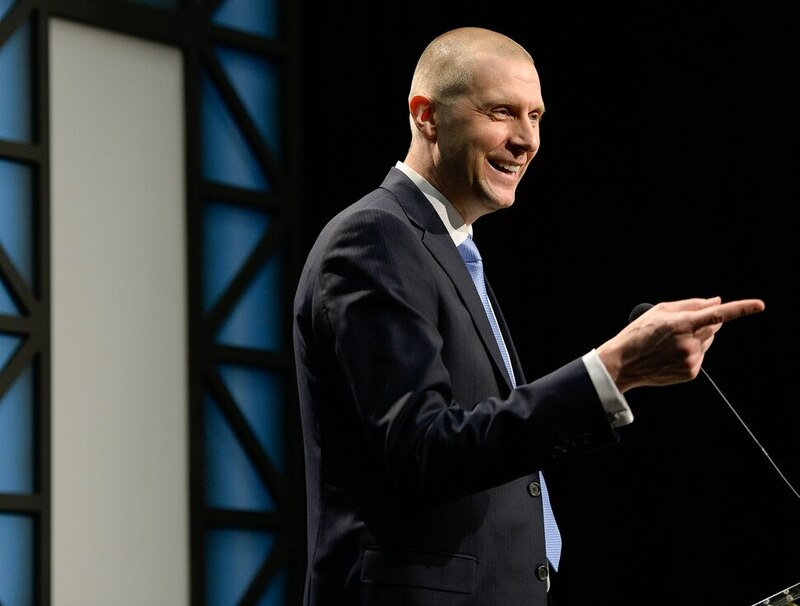 Provo • New BYU basketball coach Mark Pope and BYU athletic department administrators Tom Holmoe and Brian Santiago talked about finding a “secluded, secret place” to meet a few weeks ago to discuss the opening a day or two after veteran coach Dave Rose retired. They decided there was no such place in Provo and threw caution to the wind, deciding to gather on the floor of the Marriott Center, where the Cougars play home games in front of up to 19,000 fans. Turns out it was a brilliant move by the guys doing the hiring, because that was one of the first moments when Pope realized the BYU job might be right for him. He had been a bit reluctant to take the job because of the great success he was having at neighboring Utah Valley University, and the great team he was expecting to return this season. He also had his eye on some other openings around the country. Another persuasive moment came when Pope, 46, was alone and he used one of his own recruiting tactics on himself. Holmoe reiterated after the news conference that head coaches of all BYU sports must be members of the faith that owns and operates BYU, The Church of Jesus Christ of Latter-day Saints. Pope is already familiar to BYU administrators and fans alike because he was Rose’s assistant at BYU the first four seasons that the school was in the West Coast Conference (2011-15). Holmoe said Pope, who compiled a 77-56 record at UVU, will have total autonomy in picking his assistant coaches. All three of Pope’s assistants at UVU — Cody Fueger, Chris Burgess and Eric Daniels — attended the news conference. All three are likely candidates for the UVU position, along with a couple of the finalists Pope beat out for the BYU job: Portland State assistant Barret Peery, Los Angeles Lakers assistant Mark Madsen and former BYU assistant Quincy Lewis. Southern Utah assistant John Wardenburg and Westminster College coach Norm Parrish might also be candidates, given them familiarity with the region. The Wolverines went 23-11 in 2017-18 and 25-10 last season, setting a school record for most wins in a season at the Orem school. The Cougars went 98-43 the four years that Pope was Rose’s top assistant. Pope said the most difficult thing about taking the BYU job was telling his former players at Utah Valley. Pope credited his many mentors, from his high school and college coaches, including Rick Pitino, his coach at Kentucky, to Rose, who was not at the news conference. Then Pope said his No. 1 mentor is his wife, Lee Anne, “the smartest, most beautiful and funniest” person he knows. The couple has four daughters between the ages of 18 and 11: Ella, Avery, Layla and Shay. “Lee Anne is going to be a gift to this university, as well as my four wonderful and talented daughters,” he said. Pope said he met with Rose at the Final Four coaches convention last weekend in Minneapolis. “It is beyond extraordinary, what he accomplished here,” Pope said. He met with BYU’s current players before the news conference. None of those players were present. They were practicing in the Marriott Center Annex adjacent to the BYU Broadcasting Building, said Kevin Nixon, father of junior forward Dalton Nixon. Pope was making an annual salary of $200,000 as UVU’s coach, with $5,000 increases each year of a six-year deal, The Salt Lake Tribune reported last June after obtaining a copy of the agreement through an open records request. He also received $25,000 annually for his media obligations and a retention bonus of $25,000. Terms of his deal with BYU will not be disclosed because BYU is a private institution not subject to open records requests. Pope is a relative newcomer to coaching. After deciding to leave medical school in 2009, he was director of basketball operations at Georgia for one season and an assistant at Wake Forest for a season before aggressively pursuing the BYU opening when BYU assistant Dave Rice took the head coaching job at UNLV. Pope was born in Omaha, Neb., and played high school basketball in Bellevue, Wash., before playing his first two years of college basketball for the hometown Washington Huskies. He was Pac-10 Freshman of the Year in 1992 but transferred to Kentucky and was a member of the Wildcats’ 1996 national championship team. Pope was drafted by the Indiana Pacers in 1996 and spent nine years in professional basketball — seven in the NBA and two overseas — before he was cut by the Denver Nuggets in training camp prior to the 2005-06 season. He enrolled in medical school at Columbia University in 2006, but left for the coaching ranks in 2009. Lee Anne Pope is a BYU graduate and the daughter of the late Lynn Archibald, Utah’s head coach from 1983-89 and as assistant at BYU from 1994-96. Just like Holmoe and Santiago were a few weeks ago on the Marriott Center floor. 1988-91 — Starred at Newport High School in Bellevue, Wash.